According to De Telegraaf Manchester United will pay €18 million plus bonuses to bring the 24-year-old to Old Trafford, and reunite him with ex-Netherlands coach Louis van Gaal. 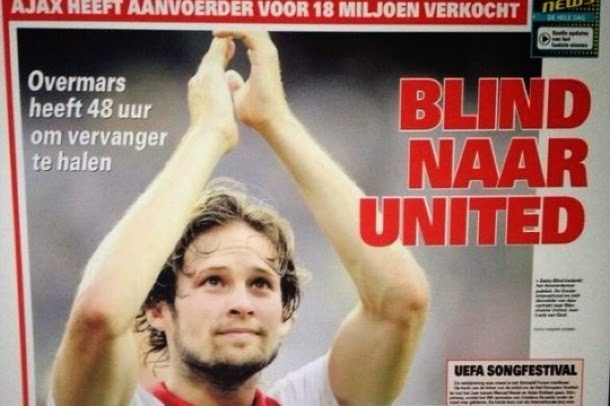 Blind still has to undergo his medical and agree personal terms with United, but these seem to be just a formality, and the deal should be rounded up before the Monday night deadline. The son of Ajax legend Danny Blind, Daley has spent his whole career with the Amsterdam club, making 124 appearances, while he spent some time on loan with Groningen in 2009. Transformed from a left back to a defensive midfielder by Ajax coach Frank de Boer, Blind has been the club’s exceptional player over the past two seasons, and won the Dutch footballer of the year award at the end of the last campaign, before going on to shine at the World Cup in Brazil. The loss of Blind will be a huge blow to Ajax’s chances of lifting their fifth straight Eredivisie title, and the club now have only 48 hours to find a replacement.